WE’RE continually running picture of lovely young ladies and writing; that their ambition is to get into the movies or television—which it usually is. But somehow. we never do hear whether they succeed in their ambitions or not. They drop into a silent limbo of girls who* want to go places but apparently never do. 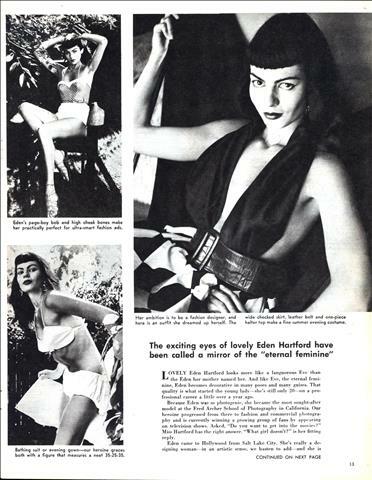 LOVELY Eden Hartford looks more like a languorous Eve than the Eden her mother named her. 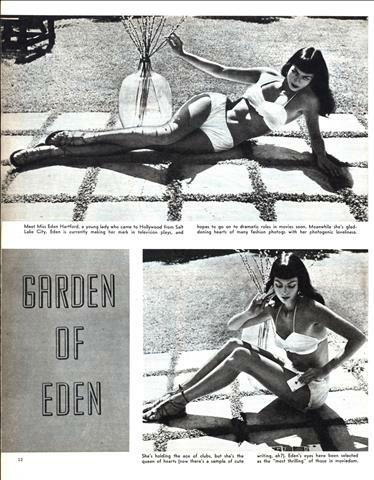 And like Eve, the eternal feminine, Eden becomes decorative in many poses and many guises. That quality is what started the young lady—she’s still only 20—on a professional career a little over a year ago.